On Dec. 19, 2017, as my wife and I walked down Adams Ave., from Park Blvd. towards Georgia, she spotted movement a few doors down from Sunshine‘s place. 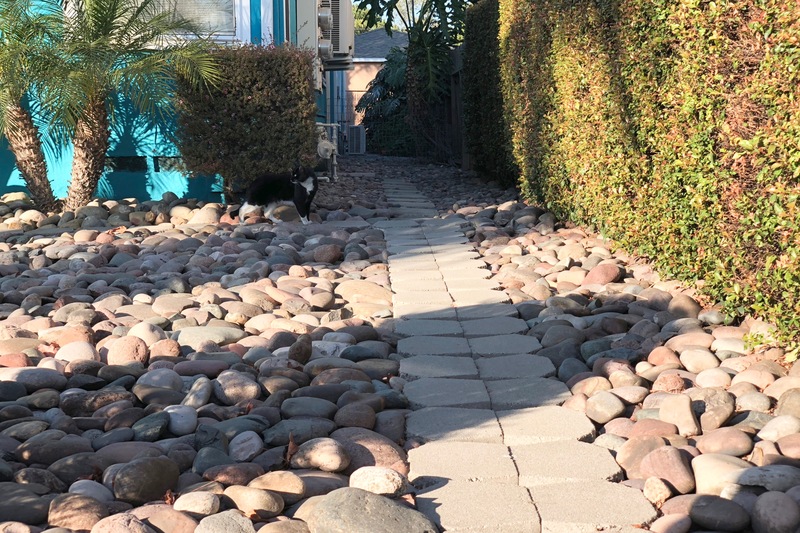 A lanky, tuxedo cautiously navigated its way from property to property. As previously expressed, that’s a dangerous area for person or beast. The intersection behind leads into a business district of bars, where too many people impatiently drive searching for parking. 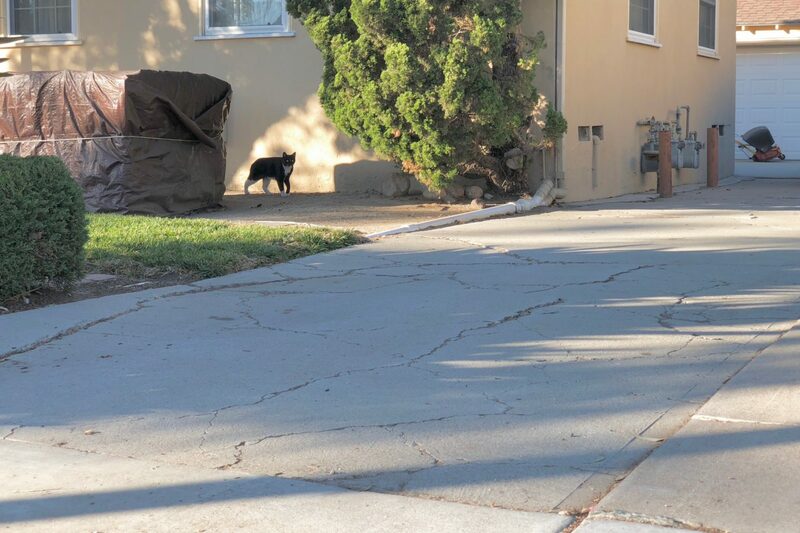 The cat meandered a safe path far back from the sidewalk, along buildings, through hedges, and across driveways. I kept pace, with iPhone X, using the second camera to 2X zoom. The three portraits put the tuxedo in full view, but others (unpublished) follow the kitty’s path. The Featured Image was captured at 2:53 p.m. PST, a frame before the second photo, which I prefer more. But the primary pic better showcases the furball, who earns nickname Bright—for being smart enough to stay far away from the street. Vitals are nearly identical: f/2.4, ISO 16, 1/302 (and 1/306, respectively), 6mm. 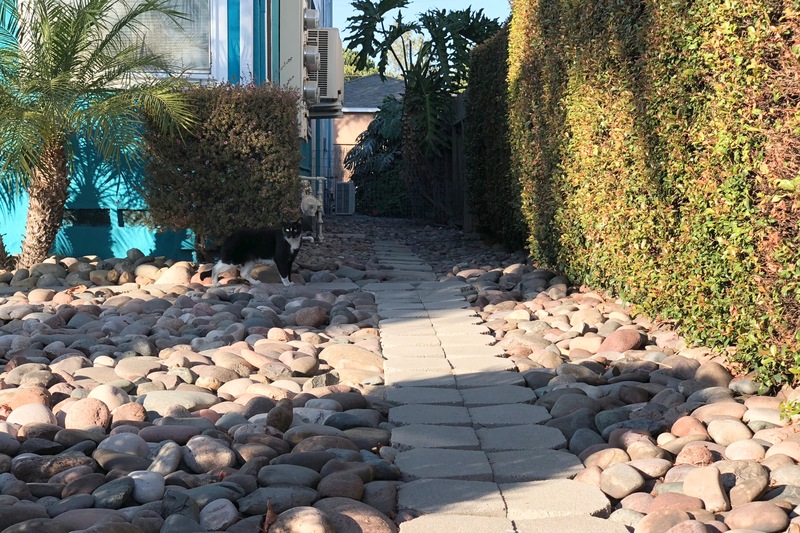 All three photos are cropped and edited, particularly brightness—so that the cat isn’t so dark along the buildings’ shadows. Hehe, there’s a second reason for the moniker. The final photo catches Bright, coming into another yard. This one was aggressively tweaked—mainly Brightness and Contrast. Vitals are same, except for 1/202 sec and 2:54 p.m. Previously Featured Felines: Scruffy, Roly Poly, Woo, Skull, Biscuit, The Colonel, White, Chipper, Frisky, Stretch, Needy, Farfisa, Mates, Hunter, Pee-Pee, Blue, Blue Too, Bonded Pair, Patience, Fess, Jumper, Frenemy, Looker, Cozy, Scout, Lurks, Skit, Mini, Betty, Black and White, Stalker, Bell, Chill, Sammy, Scratch, Poser, Star, Grey and White, Watcher, Herman, Comet, Roman, Willow, Chub, Nimbus, Watson, Lilo, Kit, Pepe, Twilight, Sebastian, Spot, Booger, Ash, Veruca, Riley, Mellow, Bonde, Flower, Glass, Black, BeBe, Fang, Bruce, Siamese, Pounce, Tortie, Haiku, Fraidy, Peso, Daniel Tiger, Dusk, Stride, Dainty, Spry, Tabby, Betty Too, Still, Levi, Shadow, Sophie, Wink, Ferals, Momma, Charlie, Tux, Cool, Benny, Jellicle, Itchy Valentino, Goldie, Nine, Amanda, Siesta, ChaCho, Charlie, Too, Mika, Crystal, Seeker, Mittens, Dancer, Smokey, Monkey, Captain Blackbeard, Season, Maven, Tink, Chunk, Curious, Hanoi, Bella, Tarry, Guido, Maxine, Mr. Kitty, Peohe, Panda, Frankie, Sunshine, Twain, Willow, Too, Brawn, Reddy, Burglar, Laramie, and Lupe.